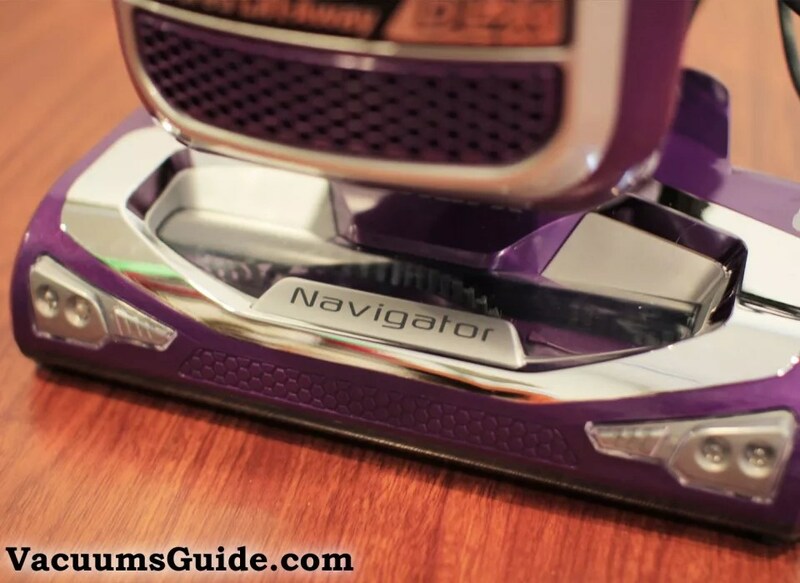 The Shark Navigator has always been a solid option for people who cannot afford to pay too much for a vacuum cleaner, but who still want to buy a product which is powerful and reliable. The newest version of Navigator, the Powered Lift-Away Deluxe stands in line with the heritage of this type of products. Although is has some minor drawbacks, the NV583 is a perfectly valid option in today's upright market. Have you ever thought of a vacuum cleaner that would double as a canister and an upright? If you’re reading my blog on a regular basis, I’m sure you’re familiar with the Lift-Away concept from Shark. You can see it in their newest Rotator models, including their latest Duoclean. The Navigator was always destined for families who need the power and the flexibility of a Rotator, but who can’t afford the price tag. There are many other small differences between the Navigator and the Rotator, so if you want to spend a minute finding out more about these, you can see the 2 products compared here. The recent Shark Navigator Powered Lift-Away Deluxe NV583 diminishes the performance gap (and I’m not only referring here to the possibility of detaching its canister from the rest of the base). This vacuum cleaner is lightweight in design, much lighter than the older Navigators. It is highly portable, efficient and easy to use. The same line also comprises of model numbers NV581 and NV581Q which are available directly on Shark’s website. Here is a comprehensive review of the specs that make these vacuum cleaners unique. This appliance shares a similar engine with older versions such as the NV355/NV356E. This is a good thing, because it is quiet and powerful. Shark imbued it with the same cyclonic technology you can seen in most of their upright models. The idea behind this tech is that the air is circulated at a very high speed to keep fine dust particles away from the main filters, thus preventing premature clogging. This way, suction power is maintained at a high level for months, even years. Regardless of the number of rooms or size of the floor space that you are cleaning, the power is maintained even when you are dealing with small particles or pet hair. Consuming 1140W (9.5 Amp, 120V, 60 Hz), this input power is enough to assure you of an efficient cleaning exercise. Perhaps you expected a higher consumption for a vacuum cleaner that maintains uniform cleaning efficiency and which serves both as a canister and an upright. Contrary to this, it is meant to be energy efficient at the same time. Yes, there is room for improvement. I expect for standard uprights to drop their consumption to 800W or less by 2020. The appliance features a large capacity dust cup, contrary to the replaceable good ol’ bag. This means that a large amount of dust, dirt and other particles is trapped in the cup, which eliminates the need to replace bags, diminishing the maintenance costs. The bin hosts around half a gallon and is easy to dump. This appliance is a completely sealed HEPA filtration system. It combines washable filters and the cyclonic technology mentioned above to ensure that dust and allergens are trapped within the vacuum. This prevents them from escaping into the air and therefore serves as a sure protection to users who may be allergic to pollen, dust and pet hairs. The efficiency of its filtration system is officially assured by the Anti-allergen Complete Seal Technology, which promises that 99.9% of particles down to 0.3 microns are captured and contained. One would think there will be less contact with allergens. However, for persons who suffer allergies or asthma, I recommend you to read my roundup on this subject here. The filters are washable. Make sure you put them back in the machine only after they are completely dry. The pre-motor filters should be washed once every 3 months. The HEPA filter can be rinsed once per year (because it is more sensible and wears faster). A heavy vacuum cleaner is not only difficult to drag along but also laborious to store. Luckly, for the NV583 this is not the case. Having mentioned already that it is a lightweight appliance, I can only add that it weights 15.4 pounds, which is ideal if you wish to carry it around. Adding the fact that it is a lift-away, you can use it virtually anywhere. Whether you want to move it up and down the stairs, its weight makes it convenient and ensures that you enjoy the cleaning exercise. It measures 12 x 9.4 x 46.1 inches. Compared to the size of the Navigator NV360 (15 x 11.4 x 45.5 inches), it is more compact and feels more sturdy. The Pet Multi Tool & the Power Brush – These are 2 of the most essential pet tools, meant to handle all pet hair issues. Whether you are cleaning floors or carpets with pet hairs, therefore, all you need are these essential accessories and you will find it easy cohabiting with your pets be they cats or dogs. A duster crevice – I really like this combo. Do you live in an area where you are frequently affected by dust? If yes, this is the accessory that will handle your cleaning needs. Even in an area free of dust, the dust brush is essential for cleaning above the floor areas such as shelves. In essence, this tool will leave your cupboards and wardrobes clean. It will also be helpful in cleaning window blinds, lamp shades and a lot more. As for the crevice tool, you need it to handle very hard-to-reach spots. Whether it is under furniture or areas really close to the wall, the crevice tool can work alongside a long-reach nose to ensure that every section is cleaned uniformly. Under-appliance wand – Whenever the crevice tool is not effective in cleaning some of the hidden areas, this is the alternative accessory you should turn to. It is highly recommended to be used under low-lying pieces of furniture. Dust-Away Hard Floor attachment with a reusable microfiber pad – This is a must have if you have hard floors. It’s perfect for tiles, hardwood, linoleum, marble and so on. Lift-Away technology – You can use it as a corded handheld, a canister or an upright. It’s your choice. The product comes with a matching-color caddy which can transform the upright straight into a canister. Swivel steering technology – This inclusion offers exceptional control over the vacuum cleaner’s nozzle. It is thus easy to move around objects and furniture and ensures that every target area is cleaned effectively. Brushroll shutoff – This is one of the inclusions in the appliance that increases its versatility. With the convenience of switching the brushroll on and off at any given moment, you can easily transition from cleaning bare floors to carpeted areas. Variable suction – You can use a slider button to variate the suction. LED lights – Great for spotting hidden dirt. Generous power cord – The cord on this vacuum cleaner is 25 ft long, which allows you to clean a large area without necessarily moving the vac. Easy-to-clean bin – The dustbin on this vacuum cleaner has been made with all the convenience that you can think of. The bottom and top can both open up so that you empty the debris from whichever angle you consider appropriate. You can then wash the canister alongside the filters but be sure to dry everything before using it again. Motorized floor-brush nozzle – To ensure that it is highly effective in every cleaning exercise, the manufacturer has included a motorized floor-brush nozzle. Its vibration and motorized nature picks all forms of dirt, dust and particles, to leave surfaces sparkling clean. I’ve had a great time using it, thanks to inclusions such as the swivel steering, the lift-away design, the accessories set, the powerful suction and the HEPA filtration. It has the ability to clean bare floors and carpeted areas with precision. Even high-pile carpets are tackled reasonably. The usability of this appliance is enhanced by the versatility of the attachments. You can use the attachments with the long tube or with the short handle. While most vacuum cleaners are not specialized to clean things such as window blinds and lamp shades, Shark Navigator Lift-Away DLX has all the attachments to help you deal with most of these. Comes with a 5-year warranty, offered directly by the producer. This is valid, no matter from where you by your Shark. Sells around $200 on Amazon. Here’s a deal which you may want to check out. I would love some feedback from you guys! What do you think about the new Navigator upright?